In a step that is likely to boost peace and give new shape to regional energy cooperation, India, Pakistan, Afghanistan and Turkmenistan, on Wednesday, inked the historic gas sale purchase agreement (GSPA) for the $7.6-billion Turkmenistan-Afghanistan-Pakistan-India (TAPI) gas pipeline, often touted as the peace pipeline. Turkmenistan, which holds more than 4 per cent of the world's natural gas reserves, signed agreements to sell gas to India and Pakistan through the 1,680 km pipeline at the Caspian Sea resort of Avaza in Turkmenistan, according to a statement issued here. For India, the agreement was signed by GAIL (India) Chairman B. C. Tirpathi in the presence of Petroleum and Natural Gas Minister Jaipal Reddy who described the signing of the GSPA as "no ordinary event" and a triumph of multilateralism, regional cooperation and economic integration. The TAPI pipeline will have a capacity to carry 90 million metric standard cubic metres a day (mmscmd) of gas for a 30-year period and is likely to become operational by 2018. India and Pakistan would get 38 mmscmd each, while the remaining 14 mmscmd will be supplied to Afghanistan. Besides Mr. Reddy, the GSPA, signed by national oil companies of the four nations, was witnessed by Turkmenistan Oil Minister, B. Nedirov, Pakistan's Petroleum Minister Asim Hussain and Afghanistan's Minister of Mines Wahidullah Shahrani. "Without a doubt, the economic benefits of the TAPI gas pipeline will be immense for our energy-starved economies. The flow of natural gas will bring in industrial and economic development in our countries," Mr. Reddy said. "It is our belief that the TAPI gas pipeline will transform the politics of this region." Hopefully, the spin-off benefits of this pipeline will encourage us to emphasise trade and investment issues over contentious political issues and enable us to build trust and confidence among ourselves as neighbours and partners in progress," he said. Last week, the Union Cabinet gave its nod to the signing of GSPA and also approved the payment of 50 cents per million metric British thermal unit (mmBtu) as the transit fee to Pakistan and Afghanistan for the gas. The contract price of TAPI gas is linked to a formula which contains indices based on fuel basket and other indices which are not as volatile as crude oil. The formula is similar to the ones used in international contracts. The U.S. is backing the pipeline as an alternative to the India-Pakistan-Iran (IPI) pipeline that has been stalled for quite some time now due to U.S. pressure on India and Pakistan not to go ahead with the project. The pipeline will run from the Turkmenistan gas fields to Afghanistan. It will start from the Dauletabad gas fields and run into Afghanistan alongside the highway running from Heart to Kandahar and then via Quetta and Multan in Pakistan. The final destination of the pipeline will be Fazilka near the India-Pakistan border. Cycle rickshaws, an eco-friendly mode of transport, continue to play a role in para-transit and non-motorized modes of transport in Indian cities. The world's first dial-a-rickshaw service, Ecocabs, was initiated in Fazilka, Punjab in 2008 by Graduates Welfare Association Fazilka, an NGO dedicated to education, employment, environment and energy. The concept was successful, and it has now been taken to 21 other cities in the state of Punjab. According to estimates, nearly 60 lakh (6 million) people travel on cycle rickshaws in Punjab every day. The Ecocabs scheme has been instrumental in employment generation, becoming a source of livelihood for about 3 lakh (300,000) families and reducing use of fossil fuels. 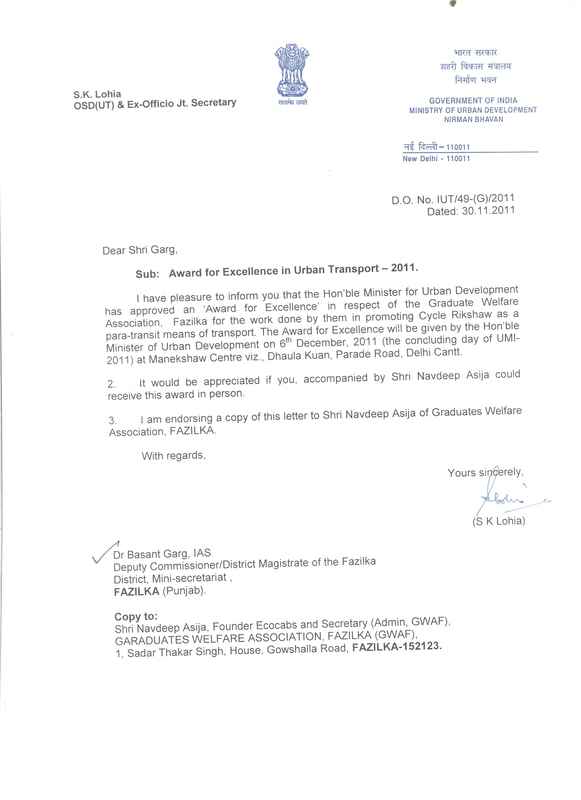 In 2011, Fazilka Ecocabs won the National Award for Excellence in Non-Motor Transport from the Ministry of Urban Development, Government of India. The project has also received international attention and was one of the 15 finalists for the SMART Mobility Enterprize. The key to the cycle rickshaw—or ecocab—operations has been the improvement of the existing rickshaw design, along with the introduction of a hub-and-spoke model of operations. In Fazilka, ninecall centers have been strategically spread around the town, and each of these serve an average of 1,500 households. The cycle rickshaws are ergonomically designed and are offered at a very affordable price. The service is usually available between 9:00 a.m. and 6:00 p.m. The scheme functions very similar to the dial-a-cab service and all rickshaw pullers, also known as traction men, have been provided with cell phones. The new rickshaws, including models called Femto and Nano, designed with ergonomic principles, are lightweight, low-floor and carry extra luggage and advertisement space. Additional revenue can be generated for the traction men with the use of the advertising space. A similar practice has been adopted for auto-rickshaws in several other cities. There are a total of 500 members of the project in Fazilka. All traction men receive several benefits, including free health checkups, accidental insurance for 50,000 INR (US$918), and access to credit financing schemes of leading banks, among others. They are also provided with work uniforms and have to follow a code of conduct, which, if broken, can lead to the confiscation of their rickshaw license. The project helped increase the latent demand for cycle rickshaws and has contributed towards improved well-being of rickshaw pullers and their families. The ecocab services are operationally efficient and include benefits for the rickshaw pullers, users and society at large. With the success of the scheme and national-level recognition of it, several other cities, including Delhi and Jaipur, are considering implementing a similar dial-a-rickshaw system. In addition, the idea also finds mention in the country's 12th Five-Year Plan, under the low carbon mobility agenda. Read all about the history of cycle rickshaws in the virtual rickshaw museum. New Delhi, May 17: The Union cabinet has given its approval to the agreement to bring gas from Turkmenistan via Afghanistan and Pakistan. Officials said the cabinet had also approved the transit fee to bring gas through the $7.6-billion Turkmenistan-Afghanistan-Pakistan-India (TAPI) pipeline. Petroleum minister S. Jaipal Reddy is slated to visit Turkmenistan next week to sign the sale and purchase agreement, officials said. The gas will be purchased for about $8 to $10 per million British thermal unit at Turkmenistan's Dauletabad gasfield. It will be transported through a 1,680km pipeline traversing the Herat, Helmand and Kandahar provinces in Afghanistan. The pipeline will pass through Multan in Pakistan and end at Fazilka in Punjab. Turkmenistan will deliver the gas at the Afghanistan border and thereafter a consortium of companies would take responsibility for establishing, operating and maintaining the transnational pipeline. Apart from the gas price, India will pay $0.50 per mmBtu (million metric British thermal unit) as a transit fee to Afghanistan and Pakistan. The delivered price of gas on the Indian border will be $10-$12 per mmBtu compared with $4.20 per mmBtu price of domestic gas and $16 per mmBtu rate of gas imported in ships in liquid form. Observing that the UT administration had been "stonewalling" the court directions over making Sector 17-E a no-vehicle and pedestrian friendly zone for quite long, the Punjab and Haryana high court said neither the authorities were open to new ideas as proposed by the court nor were they taking any measures. Special division bench comprising justice Surya Kant and justice Ajay Tewari suggested that 400 vehicles being accommodated in the parking lot in front of Empire Stores can be shifted to a ground near RBI, on pilot basis for a month. The municipal corporation had informed the court that there was no alternative space available for accommodating vehicles if Sector-17 parking lot was made vehicle-free. The bench observed that the suggestion of making the parking lot a no-vehicle zone was being opposed "tooth and nail" by the administration and when the bench suggested of removing 400 cars from the parking lot to some other place just to check results, the authorities were diverting court's mind that by saying they were coming up with multi-level parking lots, which would take time. "Unless you have a long-term policy based on people's feedback and research, nothing is going to work. For many months, we have been wasting time. Who are officials delaying it? At least, tell us," it said. However, the senior UT standing counsel told the bench that the administration was making all-out efforts to come up with a concrete plan but there were many practical problems in way. The court issued the directions to amicus curiae (friend of court) advocate APS Shergill, Rita Kohli and Navdeep Asija to visit Sector-17 parking lot and give detailed report by Wednesday. Directions were also issued to the MC to extend cooperation to the advocates in order to come out with a solution. The case would now come up for hearing on May 18. DILIP SINGH looks important. A rickshaw puller by profession, he is also the president of the south zone Ecocab's Dial-a-rickshaw service in Fazilka, a town in Punjab. Wearing a crisp shirt and smart shoes, he flashes his android cellphone and says, "Gone are the days when rickshaw pullers were known for dirty, unkempt looks." Just like taxis in other cities, rickshaws in Fazilka arrive at the doorstep when called on their service number. Complete with a fleet of uniform-wearing pullers and a strict etiquette code to follow, Dial a rickshaw is a modern twist to an old mode of transport. The rickshaw pullers can lose their licence if found misbehaving. Says Navdip Asija, an IIT graduate and a leading member of Graduates Welfare Association, Fazilka: "We did not want rickshaws to be known as a poor person's transport. In this town even the wealthy and the aged demand such services." One can locate the nearest Ecocab call centre by using Google Maps or GPS. Ecocab also has a website where one can check details of the registered rickshaw pullers. Every day about 500 rickshaw pullers ferry 10,000 passengers. Each zone in the town has a dedicated phone number and at least 30 rickshaw pullers are available round-the-clock. Every puller owns a cellphone. Around 65 per cent of the pullers own their rickshaws. Ecocab provides each puller an insurance policy worth Rs 50,000. A set of woollens every winter and medical checkup and medicines are also offered at discounted prices. They also get legal aid and support for children's schooling. Fazilka's community is reaping the benefits of the service. The Ecocab saves as much as 1,500 litres of fuel every day for the city. It has made travel safer. Resident Asha Kumari says, "Initially it used to be a long walk before I could get a rickshaw. Now all I have to do is pick up my phone. I also feel very safe." The service has helped the prime business area of Ghanta Ghar become a car-free zone. Following the services' success, the Punjab and Haryana High Court has issued suo moto direction to both Punjab and Haryana to find ways to replicate Ecocab service in the rest of the state. Millions more Indians travel by foot, bicycle and bus than travel by car, but you'd never guess it from the design of India's cities or the allocation of government funds. A handful of interesting organizations is fighting for the rights of zero emitters, however. The Center for Science and Environment (CSE) magazine Down To Earth reports that a number of groups, ranging from rickshaw pullers in the Punjab to bicycle crazy yuppies in Haryana are working to influence policy makers and change the way India thinks about urban infrastructure. Ecocab's Dial-a-rickshaw service in Fazilka, Punjab, for instance, is revamping the "outdated" bicycle rickshaw as a cutting-edge, modern form of transportation by focusing on its naturally eco-friendly qualities. The Manipur Cycling Club, in the northeastern state of Manipur, is manufacturing bicycles from bamboo to simultaneously create a source of employment and encourage eco-friendly transportation. The Namma Cycle movement initiated by Ride-A-Cycle Foundation has made free-to-share bicycles available around educational institutes and recreational sites in Bangalore. And Rickshaw Bank offers a microfinance-type scheme combined with a cheaper, lighter rickshaw designed at the Indian Institute of Technology (Guwahati), in Assam, to free rickshaw pullers from endless rental payments to the cartel of rickshaw owners. Over the past decade, laws have banned cycle rickshaws from prime areas of many cities to make room for cars. Delhi is fighting a bitter battle to protect its 0.6 million cycle rickshaw fleet as Delhi Municipal Corporation (Cycle-Rickshaw) By-laws of 1960 has restricted their number to 99,000 in ear-marked zones. The Act has also empowered authorities to confiscate, crush and sell rickshaws if they are found plying without a licence. But reprieve came from the Supreme Court when in its April hearing of the public interest petition it quashed the civic body's bid and castigated it for taking away the right of the "weak and meek". The apex court asked the municipal corporation, "Are you prepared to scrap cars? Impound those involved in drunken driving or even remove them from roads, say for a period of 10 years?" In 2008 Kolkata curtailed bicycles on 39 key roads following a notification issued by the city's police. It states that with a view to "providing safe and uninterrupted movement of vehicular traffic, we hereby order that no bicycle shall ply or remain standing between 9 am and 7 pm on all days". Activist Debasish Banerjee of Kolkata laments, "It is ironical that while globally cities are bringing back bicycles and trams, Kolkata despite its rich legacy is letting them decay." The National Urban Transport Policy has made the right noises about promoting walking and cycling. However its funding arm, the Jawaharlal Nehru National Urban Renewal Mission (JNNURM), has played spoilsport. Almost the entire booty so far has been given for roads, flyovers and parking structures. Only a few small-scale projects in smaller cities like Nanded in Maharashtra have seen some transformation of its footpaths and cycling paths. Currently, the Union Ministry of Urban Development is framing a public bicycle sharing scheme. But the Planning Commission has already argued against it, citing lack of funds. Bhupinder Singh, a retired professor from IIT Roorkee, who is based in Fazilka, and is the recipient of the Urja Purush award by the Uttarakhand government, has introduced solar energy-based fans, coolers and air conditioners. The equipment would work on solar energy during the day and will require minimum investment, without the use of any battery and will help save grid energy. "Since the sun rises for more than 260 days in a year in Punjab, hence, the shopkeepers, office and house owners can save grid power by using solar power equipment during the day in summer," said Singh. For this, there will be a need to set up sun radiation photovoltaic (PV) panels which would meet the demand during the day. The significance of the project is that the consumers do not need batteries as these have to be replaced after about two years, which would have resulted in cost escalation. The panels generate the energy which runs the fans and coolers. Singh demonstrated the two systems today at his research centre in Ghas Mandi, Fazilka. One is a DC fan of 9" diameter run by a 90 W PV panel during the day time without any battery. It can provide spot cooling. Another is a standard PV set of panels with 90x3 W coupled to an inverter and a small battery capacity to operate an AC or a desert cooler. "A consumers needs to spend only Rs 4,000 on the project to run a fan, having a life of 10 years without incurring any expense," said Singh. 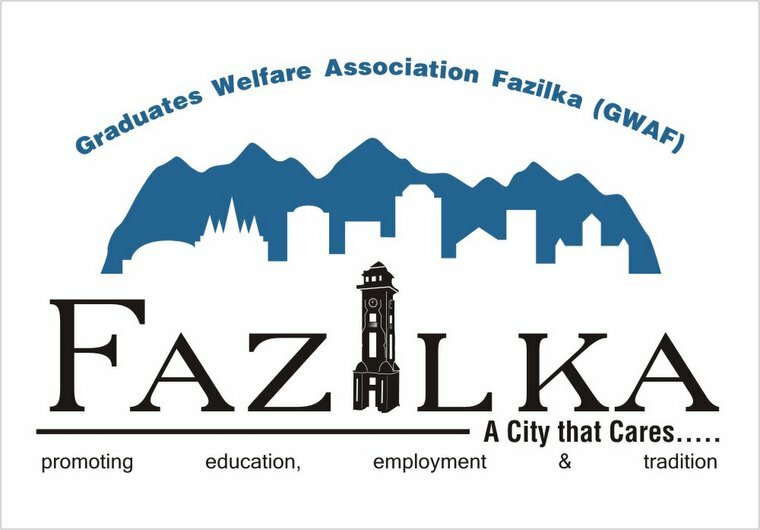 A patron of the Graduate Welfare Association, Fazilka, Singh called upon consumers to joint hands to tap solar energy during this summer. He invited them to watch the system at his research centre in Ghas Mandi. He regretted that the Punjab Energy Development Agencies (PEDA) has been allegedly unsuccessful in motivating people to conserve energy. In 2009, when Nirmal Kumar first started G-Auto, a dial-a-rickshaw service, little did he know that it would grow into a hugely successful entrepreneurship initiative spanning four cities in just three short years. After Ahmedabad, Baroda and Gandhi Nagar, G-Auto is now poised to commence operations in the city of Rajkot, in partnership with the Rajkot Municipal Corporation. Starting off small as a social project under the Nirmal Foundation, he sold the idea to 1,000 drivers in Ahmedabad and gradually got several more on board. Today, in the cities of Ahmedabad, Baroda and Gandhi Nagar, G-Auto has 10,000 rickshaw drivers and several thousand happy customers. Although the idea isn't revolutionary, it has dramatically changed the rickshaw landscape, connecting passengers to rickshaw drivers, offering honest, safe and reliable para-transit services. Nirmal Kumar's G-Auto has been shortlisted for the SMART Mobility Enterprize ("MobiPrize") award conceived and developed by the University of Michigan SMART initiative and its local and international partners, with support from The Rockefeller Foundation. The award seeks to honor entrepreneurial ventures that are changing the world—helping to improve quality of life and revitalize the environment and economy—through sustainable transportation, or "new mobility." Another entry shortlisted for the award is Navdeep Asija's Fazilka EcoCabs, set up in 2008 with the mission to organize and improve the existing cycle-rickshaw operations in the town of Fazilka, Punjab. Using modern management tools and real-time technology, this dial-a-rickshaw service promotes an environmentally friendly and sustainable para-transit mode of public transport, as an alternative to car-centric development. This system can be used as a feeder to mass rapid transit and achieve low-carbon mobility. Navdeep started off with 500 cycle-rickshaw "pilots," as he likes to call the drivers, and launched the world's first dial-a-rickshaw service with cycle-rickshaws using five call centers. The project uses an advanced mobile phone-based intelligence system that connects users to rickshaws, building on the core commitment of EcoCabs, which is accessibility and quality of service. The town of Fazilka is divided into zones, each with a unique three-digit code that becomes the last three digits of the call center number that users from a particular zone need to ring to book a rickshaw. EcoCabs also has a downloadable Android app, an interactive web portal, advanced database management systems and user information guides to aid ease of access for users. EcoCabs and G-Auto strive to benefit not only passengers but also drivers, ensuring social and financial inclusion, making them responsible and socially aware. A range of benefits are available to the rickshaw drivers, including training, health care, insurance, legal aid, educational allowance for their children, and a unifying brand image of an organized fleet operation that assures safety and reliability for users. Click here to vote for the top three projects of your choice. The three grand prizes include a $5,000 cash award, a trip to Rio +20 in June 2012 to receive the prize, and dedicated time with expert entrepreneurial mentors.